Money raised will be used to create Vail's Garden, an outdoor classroom at PPIS, in honor of our friend Vail Johnson. The funds donated will go directly to purchasing tables, benches, landscaping materials, and signage for the garden which will be located outside the PPIS cafeteria for all students and staff to utilize for class instruction and during lunches. The initial design includes a tree as the focal point for the area and creating a painted rock garden made up of rocks designed by each student at PPIS. Additionally, the surface will be changed to crushed granite for year around access and easy maintenance. Other features include installing picnic tables, benches, and outdoor dry erase boards. There will also be a special display created of "Friendship" written by Vail to remind all who visit the area of what true friends are and the kindness of our sweet friend. 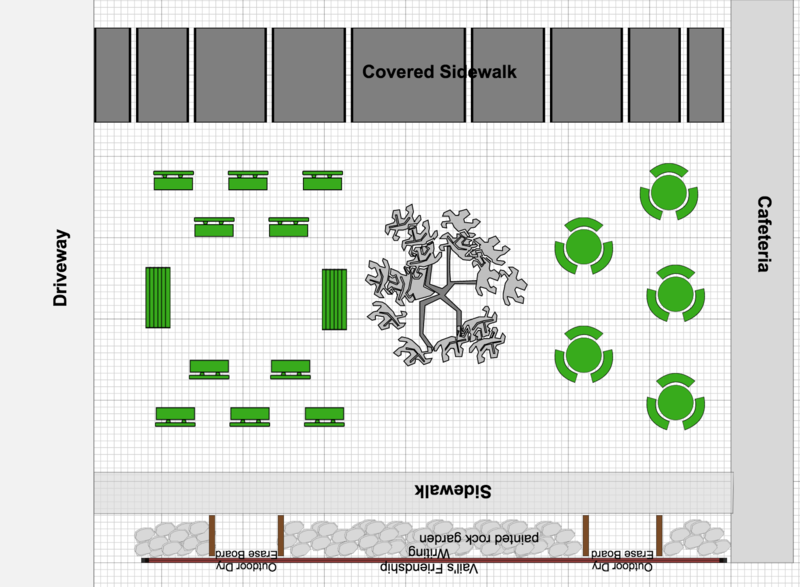 With additional funds over time, the plans include adding covered areas such as pergolas over the benches to provide shade for the outdoor classroom. If we do not reach our goal, we will continue with the project on a smaller scale and add features over time as funds are available. Make a donation in honor of an individual. Make a donation from your family. General sponsorship for landscaping materials. $600 will purchase a bench. $1000 will purchase one picnic table.